Pin down Donny Osmond and it’s clear why he’s tough to reach: he never slows down. 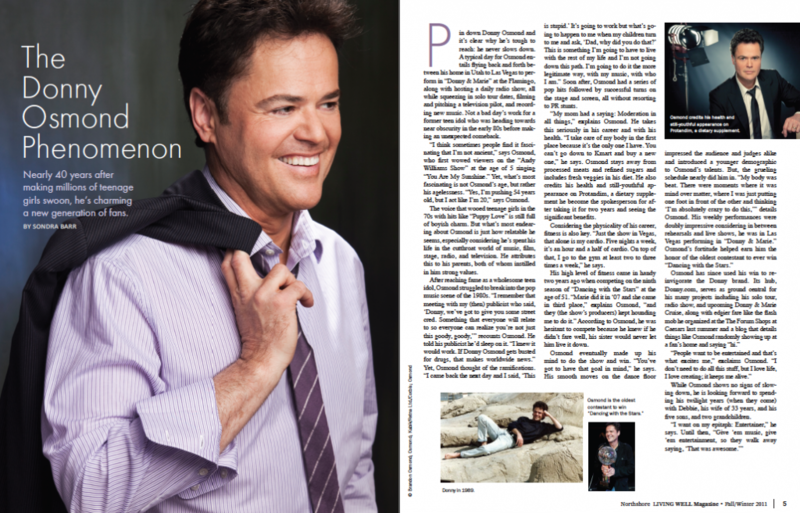 A typical day for Osmond entails flying back and forth between his home in Utah to Las Vegas to perform in “Donny & Marie” at the Flamingo, along with hosting a daily radio show, all while squeezing in solo tour dates, filming and pitching a television pilot, and recording new music. Not a bad day’s work for a former teen idol who was heading towards near obscurity in the early 80s before making an unexpected comeback. “I think sometimes people find it fascinating that I’m not ancient,” says Osmond, who first wowed viewers on the “Andy Williams Show” at the age of 5 singing “You Are My Sunshine.” Yet, what’s most fascinating is not Osmond’s age, but rather his agelessness. 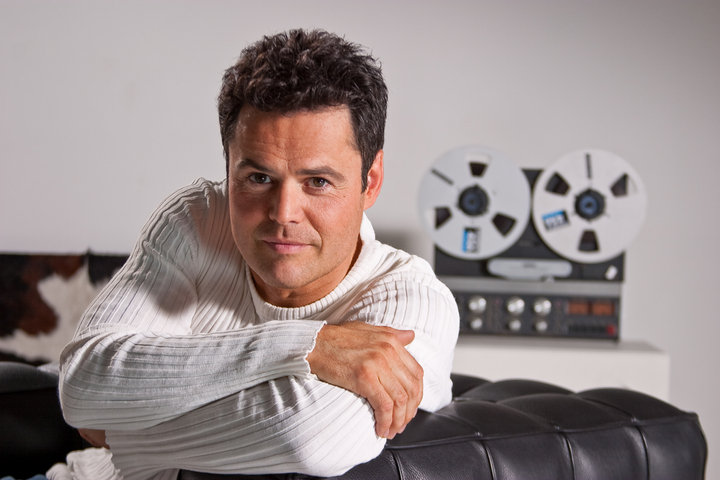 “Yes, I’m pushing 54 years old, but I act like I’m 20,” says Osmond. The voice that wooed teenage girls in the 70s with hits like “Puppy Love” is still full of boyish charm. But what’s most endearing about Osmond is just how relatable he seems, especially considering he’s spent his life in the cutthroat world of music, film, stage, radio, and television. He attributes this to his parents, both of whom instilled in him strong values. After reaching fame as a wholesome teen idol, Osmond struggled to break into the pop music scene of the 1980s. “I remember that meeting with my (then) publicist who said, ‘Donny, we’ve got to give you some street cred. Something that everyone will relate to so everyone can realize you’re not just this goody, goody,’” recounts Osmond. He told his publicist he’d sleep on it. “I knew it would work. If Donny Osmond gets busted for drugs, that makes worldwide news.” Yet, Osmond thought of the ramifications. “I came back the next day and I said, ‘This is stupid.’ It’s going to work but what’s going to happen to me when my children turn to me and ask, ‘Dad, why did you do that?’ This is something I’m going to have to live with the rest of my life and I’m not going down this path. I’m going to do it the more legitimate way, with my music, with who I am.” Soon after, Osmond had a series of pop hits followed by successful turns on the stage and screen, all without resorting to PR stunts. “My mom had a saying: Moderation in all things,” explains Osmond. He takes this seriously in his career and with his health. “I take care of my body in the first place because it’s the only one I have. You can’t go down to Kmart and buy a new one,” he says. Osmond stays away from processed meats and refined sugars and includes fresh veggies in his diet. He also credits his health and still-youthful appearance on Protandim, a dietary supplement he become the spokesperson for after taking it for two years and seeing the significant benefits. Considering the physicality of his career, fitness is also key. “Just the show in Vegas, that alone is my cardio. Five nights a week, it’s an hour and a half of cardio. On top of that, I go to the gym at least two to three times a week,” he says. His high level of fitness came in handy two years ago when competing on the ninth season of “Dancing with the Stars” at the age of 51. “Marie did it in ‘07 and she came in third place,” explains Osmond, “and they (the show’s producers) kept hounding me to do it.” According to Osmond, he was hesitant to compete because he knew if he didn’t fare well, his sister would never let him live it down. While Osmond shows no signs of slowing down, he is looking forward to spending his twilight years (when they come) with Debbie, his wife of 33 years, and his five sons, and grandchildren. HOW IS YOUR TAX HEALTH? I love it the Donny is a spokesman for Lifevantage and Protandim. He is the perfect fit for a wonderful company. His character and ability are superior which fits perfectly with the Lifevantage Company. Protandim is in a class all it’s own. You if want to stay healthy and give your body the best supplement there is on the market then take a look at Protandim.